Media Award of Excellence, in the category of Tourism Marketing Campaign Under $50,000. Nominees for the awards are carefully selected by independent committees of industry representatives. Finalists for these awards highlight the best of the province in tourism events, innovations, marketing campaigns, partnerships and sustainability, among others. Amherstburg’s Canuck it Up! Festival drew a crowd of 80,000 over two days, and featured tall ships, indigenous performers, tours, historic games, a lumberjack show, and re-enactments. It was also a stop for the famed six-storey, 13,600 kg. 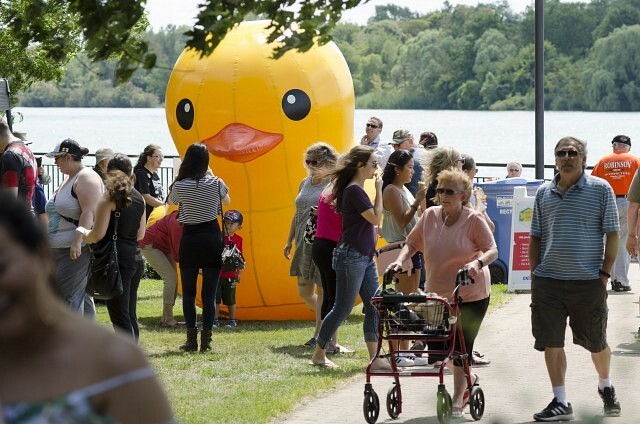 rubber duck that generated a record economic impact of $7.6 million throughout the entire province. Award winners will be announced on October 23rd at the Ontario Tourism Awards of Excellence gala night at Caesars Windsor.